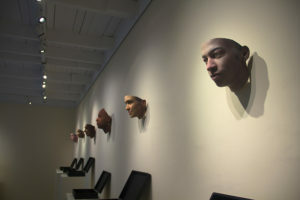 A photo taken from artist Heather Dewey-Hagborg’s exhibition “Stranger Visions” in which she creates portrait sculptures based off of DNA analyses. Photo courtesy of Ars Electronica at Flickr Creative Commons. While Chelsea Manning, the U.S. Army soldier who spent several years in jail for leaking classified data to the internet was in prison, it was prohibited to take photos of her. For all that time, only one mugshot was released, a picture of the intelligence analyst with a shaved head in her army uniform. And yet, it was her visage that portraitist Heather Dewey-Hagborg wanted for her art installation. Not a photograph or a painting or a drawing. Instead, she sent the soldier a packet for cheek swabs and hair clippings. And Manning sent it back. Dewey-Hagborg’s interest in Manning was sparked by a magazine who asked her to make a 3D-modeled image of Manning for a feature profile. After that, she spent two years with the soldier working on this project, visiting her in the Kansas military prison. She had the DNA analyzed and a range of possible facial variations generated. They all resemble Manning, but on a wide spectrum. They have different skin and eye colors. They have different jaws and cheeks and noses. Some make the viewer think more of a man, others more of a woman. “Prisons try very hard to make us inhuman and unreal by denying our image and thus our existence, to the rest of the world,” Manning, 29, said about her collaboration, after her May 2017 release. She placed a lot of trust in Dewey-Hagborg, only requesting that the artist not make any of the images very masculine.